I recently had the wonderful opportunity to drive the best family car for an entire week in exchange for my honest review. By the "best family car", I mean the 2014 Kia Sorento. It arrived in a beautiful dark blue color, perfectly clean and ready for me to drive it– with it's heated leather seats and all. A perfect start to a short-lasting relationship that I will certainly not forget. And after we bonded, I declared it the best family car, hands down. So grab a seat and read on to find out why the 2014 Kia Sorento makes my best family car list. I hope you enjoy! The 2014 Kia Sorento easily made my best family car list after I drove it and learned all about it's cool features. It can seat up to 7 people, has a seemingly endless amount of storage, and has safety features like you wouldn't believe. The leather seats provided the necessary luxury factory that I enjoy while driving. We had heated seating, which kept my buns toasty and warm throughout the week when we experienced some really chilly weather. The leather seats also provided a nice, clean atmosphere to the entire car which I appreciated as well. I was able to easily install my son's car seat so he can join me on the fun, too. What I loved about second row seating was that there are sunshades inside the windows that you can pull out and clip above to block out sunlight so that it doesn't irritate your child. How cool is that! I used it on several occasions when Zach was running errands with me on sunny days. There is also third row seating available with the 2014 Kia Sorento as well. I love this feature because if you have a larger family, it's an easy way to get the whole family in on the fun. For me, I would stick to the second row seating but it's nice to know that if I ever needed the expansion, it's available. There is an arm rest that pulls down in the second row to make traveling more comfortable if you're just taking along two passengers in the second row. This easily folds down and back into the seat to provide you with more room to seat another person if you'd like that as well. The sleek design of the Kia Sorento is another reason why it makes my best family car list. It just looks so friendly! Like it's smiling at you. It features LED accent lights and turn indicators, a retooled grille, and heated power mirrors. When you lock the car, the mirrors automatically close inwards which I think is a neat safety feature in case another car gets too close. And, there is also a blind-spot detection that I found really helpful. It lets you know when another car is in your blind spot when the symbol on the mirror starts blinking and if you're trying to get into that lane (while your turn signal is on) it will beep at you to let you know a car is there! I really loved this feature, it gave me more of a peace of mind. But, I wouldn't just depend solely on that feature to keep you safe. 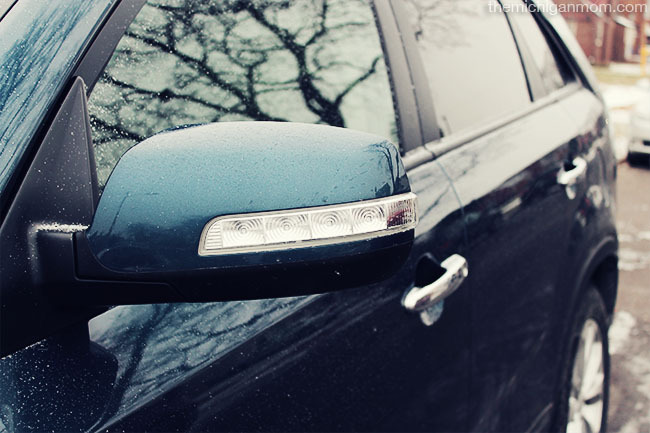 You should always double check your blind spot before turning into another lane. Can we all take a minute to just appreciate the amount of storage the Kia Sorento has to offer? I could sleep in this car. My entire family and I could sleep in this car. As if the trunk space wasn't enough, you can actually fold the second row seats to have more room. This is great if you're moving and need space for your things, if you're buying pieces of furniture, if it's your turn to bring the football team snacks and gatorade– whatever the case, the Sorento has you covered! But let's say you're second row seats aren't available because you have passengers. The carpet and casing on the bottom is actually removable for extra storage. So now you can bring the football team snacks, and bring a few players to help you load and unload them as well! This is also where you can install third row seating that would easily fold down (into this space) if you needed the extra storage that way, too. Let's not forgot what every family needs to have a great car for: GROCERIES! My family makes at least 2-3 trips to the grocery store on a weekly basis, and when we shop, we get enough for an upcoming apocalyptic catastrophe, so you better believe that trunk storage is important to us. We were able to fit two cart-fulls of groceries in this trunk with so much room to spare. So if you're like us, the Kia Sorento won't let you down when you're making a grocery run. Trust me! And you can also easily open the power liftgate with a conveniently located button inside the vehicle or by using the key fob. This makes loading and unloading faster. I felt like Deedee from Dexter's Laboratory going "Ohhh, what does this button do?!" when I sat in the driver's seat of the Kia Sorento for the first time. From the steering wheel, I was able to control a variety of things in a convenient fashion without taking my eyes off the road. I could turn up the volume of the radio, answer calls, and found the cruise control buttons there as well. The steering wheel was really comfortable and easily adjustable, as well. The 2014 Kia Sorento also feature UVO eServices which makes it easier to manage music, make hands-free phone calls, and navigate your surroundings using Google Maps™. There is AM/FM radio, you can play CDs, MP3, and there is also SiriusXM as well. There is even a USB/Auxillary input jack and Bluetooth connectivity if you want to play your music that way as well. I used the Bluetooth connectivity for music and phone calls. There is a rear camera display for added safety while you're reserving your car. This was a little confusing to me at first because my depth perception is horrible, but once I got used to it I was reversing like a pro. Sort of. Here you can also control your climate settings including the AC/Heater, your heated seats, and whether or not you want auto/dual mode for you and your passenger. The buttons on the side of the door allowed me to control the window settings in the car as well as the side mirrors. I can also power lock the doors and windows in the second row for added safety. This helped when Zach was with me because he loves pressing buttons! In the middle there is the gear shift all fancy with it's leather coating, and two cup holders for my sister and I. One feature I really loved about the 2014 Kia Sorento was the Panoramic Sunroof. It was so big! This photo doesn't do it justice. You have the option to open just the first part or the entire thing. You can also shade some of it off, and it opens to give you light and fresh air! Definitely something to experience when it's not snowing. The 2014 Kia Sorento was easy to drive in the light snow conditions we had at the time I test drove it. There are so many safety features on this car that allow me feel confident while driving it. Safety is important to any family looking for a new car, so you can check out the full safety features here. While my time with the 2014 Kia Sorento was short lived, I will always remember the time we had together. So polite. So versatile. So perfect. The 2014 Kia Sorento is definitely the best family car for us! What is your favorite feature of the 2014 Kia Sorento?